Madeline Sitting Holy is an enrolled member of the Cheyenne River Sioux Tribe. She grew up and graduated from Cheyenne-Eagle Butte High School in Eagle Butte, SD. Madeline is a veteran of the United States Navy. 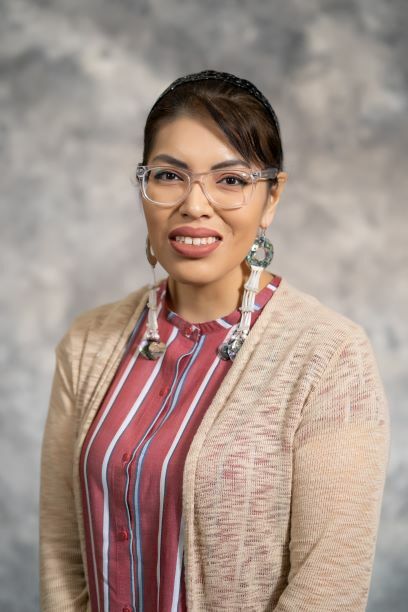 She has earned her Associates Degree in Health Information Management from Western Dakota Tech and is currently pursuing her Bachelor’s Degree in Public Health with a concentration in Nutrition and Wellness at American Public University. She is happily married to her husband John and they have two boys, Wanipila and Magaju. She enjoys spending quality time with friends and family, traveling to pow-wows, and beading.